Juniper is an evergreen tree that grows wild throughout parts of Europe, Asia, and North America. There are many varieties of juniper, but the most common is Juniperus communis, which grows to 10 feet tall and has needle-like leaves and tiny seed cones. 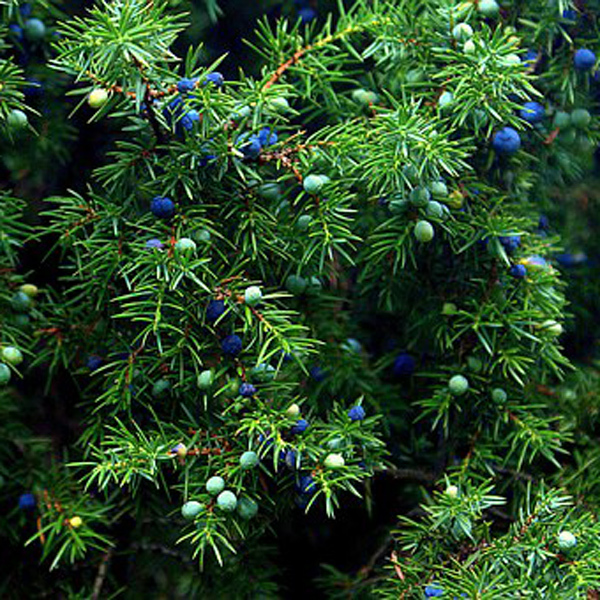 The medicinal parts of the juniper tree are known as berries but are really dark blue-black scales that come from the cones. Berries from the male juniper ripen in 18 months while those from the female juniper ripen within 2-3 years. The berries can be eaten right off the tree or dried as a nice addition to trail mix. You don’t need to eat many as their oils are strong, yet they have been used as a flavoring in foods and drink for centuries. They make an excellent addition to homemade sauerkraut since ingestion of juniper assist with inflammation and balances the production of stomach acid, a common reason for acid reflux. Juniper berry is often a part of bitter formulas to help stimulate and soothe the gastrointestinal system. Combine Juniper with chamomile in a tea as an excellent treatment for conditions such as upset stomach, heartburn, flatulence, bloating, loss of appetite and gastrointestinal infections. The antiseptic properties in juniper make it cleansing to the urinary tract, thus valuable for treatment of urinary tract infections, urethritis, kidney stones, and bladder stones. Juniper also acts as a diuretic to help with edema related to poor kidney function. This strong action on the kidneys helps rid the body of excess uric acid which can lead to gout or general joint pain and swelling. Since juniper is very warming, it is contraindicated where there is very hot inflammation of the kidneys. Juniper berry along with cedar berry is also high in natural inulin, a sugar that helps the body manage insulin levels. It was traditionally taken to help balance the function of the pancreas, usually in a formula with other healing bitters like artichoke and bitter orange. Extracts and essential oils from the juniper berries contain terpinen-4-ol, a compound that stimulates the kidneys and acts as a diuretic, along with Amentoflavone, which has strong antiviral properties. Juniper has been found effective in treatment of acute respiratory infection, staph infections and sinus infections. For sinus and bronchial conditions the inhalation of juniper, whether fresh crushed berries in hot water or drops of essential oil in hot water for a steam works well for bronchitis, pneumonia and rhinitis. Taken in a hot bath with Epsom salts it Juniper can help ease sore muscles and joints. The berries can also be infused in witch hazel as a topical treatment for acne. The essential oil of the berry diluted in a carrier oil or lotion is used topically for joint pain, sore back and to treat conditions like acne, athlete’s foot, warts, skin growths, psoriasis, and eczema.